The Colonial revival movement in the early years of the twentieth century prompted a number of wallpaper manufacturers to start reproducing antique patterns. The majority of the manufacturers were printing these copies using wallpaper printing machines, while most of the antique papers being copied were originally woodblock printed. While printing machines were the current technology and the most cost-effective, the quality of printing was very different from a woodblock: the high-speed presses required thin, watery pigments that would dry quickly, while pigments for block printing were dense and opaque. Nancy McClelland raised the bar when it came to reproduction wallpapers. She was an interior decorator and a scholar of antique furniture and wallpaper. She amassed an archive of antique wallpapers on which to base her reproductions and had her reproduction wallpapers woodblock printed in France to exacting standards. 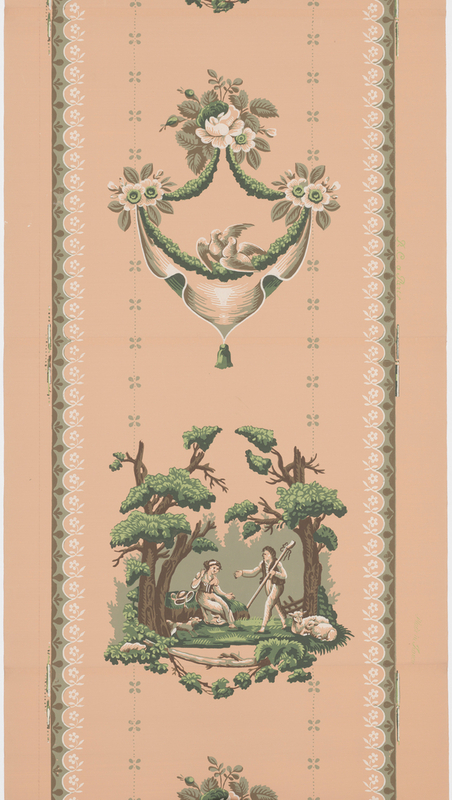 On this wallpaper she even went so far as to have the design printed on joined sheets of paper, the original way to make a roll prior to machine-made continuous paper which began in the 1820s. This design alternates two different scenes. One is a landscape view, with a shepherd and shepherdess, along with two sheep and a small dog. The couple are enframed by two large overhanging trees. A lone branch suspends an ivy swag below. This alternates with a foliate swag upon which are perched two doves, and a drapery swag or lambrequin, both of which are suspended from three petite floral bouquets. The paper copies a French design that would have been popular ca. 1810-20 and is referred to by McClelland as being in the Louis XVI style.